Move your cursor, to view pup-ups in photo collage. 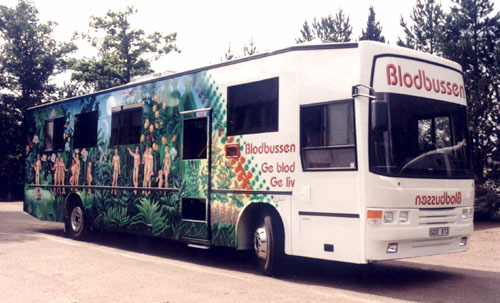 The largest quantities of blood collected by Swedish blood centrals are tapped in mobile facilities, the blood busses. As an artist Bo Veisland masters a wide range of techniques, which involves older mediums of handicraft like sculpturing, oil painting, lithography and airbrush. With the ability at hand Bo Veisland executed a decoration task and delivered the incontestable most beautiful and eye-catching decorated blood buss in the country.To keep the motive popular the inspiration towards the main motive to be found on the right side of the buss has been fetched from famous and commonly known pieces of art.Paintings by the naive French painter Henri Rousseau can be recognized in the background.